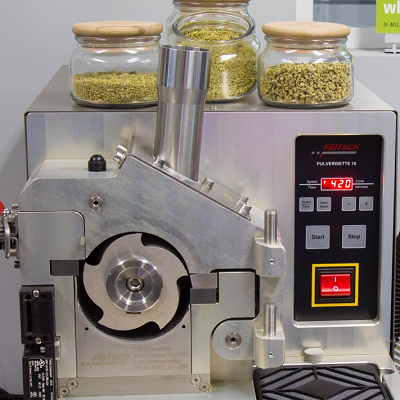 AS MEDICAL interest in cannabis increases, Fritsch says that the extraction of compounds of interest is often inefficient but that the process can be improved using its cutting mills. It recommends the Pulverisette 19 to finely mill cannabis plant material in preparation for supercritical fluid extraction (SFE) processes. A bottleneck often encountered is the low packing density of plant material in the extraction vessel, which leads to lower extraction efficiency and inconsistency in output quality. Unmilled cannabis generally packs at densities of 100-125g/l, while milled material packs at 225-250g/l. The Pulverisette 19 quickly comminutes large volumes of cannabis to a precise particle size, the company says. Negative pressure in the mill ensures a continuous flow through the cutting rotor, and prevents clogging, giving throughput up to 60 litres/h. In the example illustrated, a 2mm screen size was selected to provide high packing density, increased extraction speed, and optimised oil consistency, while allowing the operator to continuously feed the mill for efficiency. 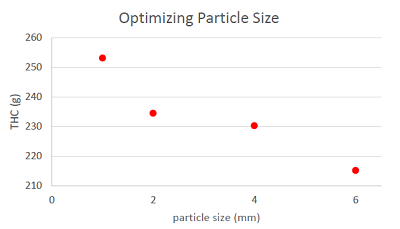 The blade speed was set to 300rpm for narrow particle size distribution, and because this low speed avoids thermal damage and loss of volatiles from the sample. It is important that the material being milled is dry, with a moisture content below 15%, to prevent clogging of the milling sieve. A full load of 4.5kg can be milled before stopping the machine to clean the sieve and milling wheel, to prevent build-up of chlorophyll and cannabis residue.